Dividend reinvestment plan commonly known as DRP or DRIP allows investors to automatically reinvest dividends when the distributions are made. DRP plans are put in place at the management discretion. For some companies, they are also called distribution reinvestment plan. As an incentive for shareholders to reinvest their dividend or participate in the plans, the price of shares issued usually is at a discount to the prevailing trading price. The list of companies with dividend reinvestment plans is on average only 2.5% of all listed companies. In addition to the issuing shares at a discount to the market trading price. Participants do not have to pay brokerage on shares purchased through DRIP plans. Today’s income can make up the largest component of the investment return over the long term due to power of compound interest from reinvestment of dividends. The figure highlight the total return differences between two scenarios: 1) if distribution income is reinvested verses 2) a non reinvestment scenario over a 10 year timeframe (such as 10 year bonds). At the end of 10 years the difference between the 2 lines is 12% . 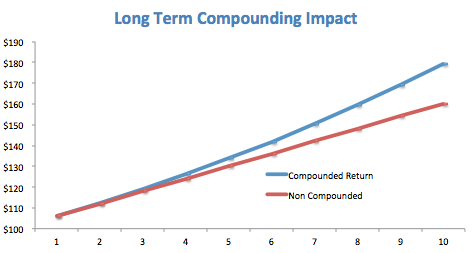 This is from the power of compound interest (assuming both start at $100 and compounded at 6% over the same time). This is a reasonable assumption given our bias towards good companies with capital preservation, growth options and patient on entry levels in the shares. We see the best use for DRP plans are for companies with attractive growth options that could require some incremental capital or managing the balance sheet in accordance with credit rating. What is an underwritten DRP? As an source of equity capital. One weakness of shareholder reinvestment plans is that it is not a reliable source of capital for companies because the amount raised is dependent on individual shareholder subscription. To offset this, companies engage investment banks to underwrite the plans as if all shareholders take up the option of reinvesting the dividend. These are called an underwritten DRP. An underwritten dividend reinvestment plan mean that the company can reliably depend on the total cash dividend paid out will be returned. Any shortfall will be made up by the banks.